Beginning in 2015, New York based music platform Audiomack recruited multi-platinum trio Migos to reimagine their hits "Hannah Montana," "One Time," and "Handsome & Wealthy" with the help of a nine-piece orchestra for the first rendition of their Trap Symphony series. Now, Audiomack has recruited yet another of hip-hop's most prominent stars to join them for a classical spin on their tracks, this time New York's A Boogie wit da Hoodie. 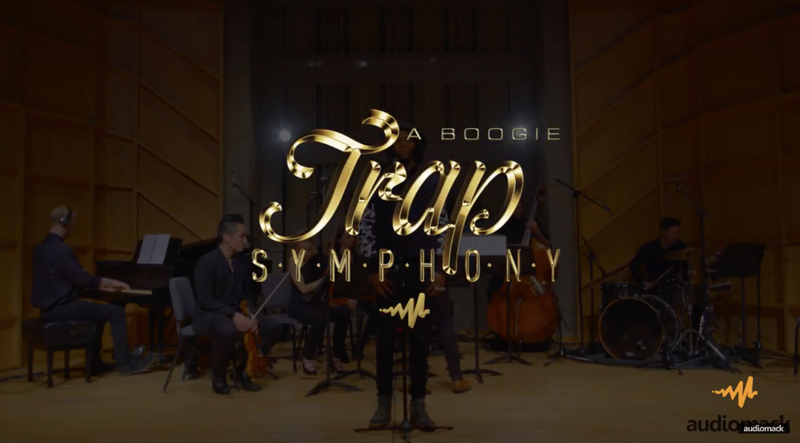 Again accompanied by a nine-piece orchestra, for A Boogie's edition of Trap Symphony, the rapper has hopped on the mic to perform three of his track's beginning with "Say A." Today, the second piece of the installment has arrived with a spin on A Boogie's 2017 single "No Promises." With the help of a full string, piano, and percussion arrangement, A Boogie sheds a different light onto "No Promises" and reinforces the melancholic message of the track with a poignant vocal performance. "As expected, the buoyant piano line and colorful verses from A Boogie pair very well with the addition of strings and live drums," describes Complex, " A Boogie comes across just as comfortable in front of the orchestra as he would performing with a DJ." Up next for A Boogie's Trap Symphony, the final installment of the series will recreate Boogie's most prominent hit, "Drowning," due for release this March 2018. In addition, fans of the Trap Symphony series will also be able to view each edition of the project, as well as additional content, via Audiomack's soon-to-be revealed platform audiomack.world that will highlight content, artists, and cultural tastemakers. In the meantime, each rendition of Trap Symphony can be viewed here.